Download high-resolution version of this image. The National Institutes of Health (NIH) has awarded $10 million to the Georgia Institute of Technology, Emory University and PATH, a Seattle-based nonprofit organization, to advance a technology for the painless self-administration of flu vaccine using patches containing tiny microneedles that dissolve into the skin. The five-year grant will be used to address key technical issues and advance the microneedle patch through a Phase I clinical trial. The grant will also be used to compare the effectiveness of traditional intramuscular injection of flu vaccine against administration of vaccine into the skin using microneedle patches. In animals, vaccination with dissolving microneedles has been shown to provide immunization better than vaccination with hypodermic needles. Vaccine-delivery patches contain hundreds of micron-scale needles so small that they penetrate only the outer layers of skin. Their small size would allow vaccines to be administered without pain – and could allow people to apply the patches themselves without visiting medical facilities. While the ability to immunize large numbers of people without using trained medical personnel is a key advantage for the microneedle patch, the researchers have learned that administering the vaccine through the skin creates a different kind of immune response – one that may protect vaccine recipients better. Developing an administration system that will be simple to use, intuitive and reliable. “Our goal is to make these patches suitable for self-administration, so that anybody could take a patch out of an envelope, put it on, and have it work with high reliability,” Prausnitz said. Evaluating the economic, regulatory, social and medical implications of a self-administered vaccine. PATH, an international nonprofit organization, will assist with this work, and will help strategically address any issues. “We will be assessing the barriers that may exist to introduction of a self-administered flu vaccine so we can anticipate those issues and develop possible solutions,” said Darin Zehrung, leader of the vaccine delivery technologies group at PATH. The funding will come from the Quantum program of the National Institute of Biomedical Imaging and Bioengineering (NBIB), which is part of the NIH. The initiative is designed to bring new medical technologies into clinical use. While the funding focuses specifically on influenza vaccination, the lessons learned may advance other microneedle applications – including vaccination efforts in developing countries where skilled medical personnel are limited and concerns about re-use of hypodermic needles are significant. U.S. penny, for size comparison. Additional design and development of the microneedle patch will largely be done at Georgia Tech, with vaccine development, immunological studies and the Phase I trial carried out at Emory University. The trial, to be conducted by the Hope Clinic of the Emory Vaccine Center, is expected to take place during the final year of the grant, setting the stage for Phase II and Phase III clinical trials that would be required to obtain FDA approval. Ultimately, the goal will be to produce an influenza vaccine delivery patch that could be made widely available. Prausnitz expects that will be done by an established company with the ability to manufacture and market the devices. Microneedle drug and vaccine delivery systems have been under development at Georgia Tech and elsewhere since the 1990s. The technology got a significant boost in July of 2010 with publication of a study in Nature Medicine that showed mice vaccinated with dissolving microneedles were protected against influenza at least as well as mice immunized through traditional hypodermic needle injections. 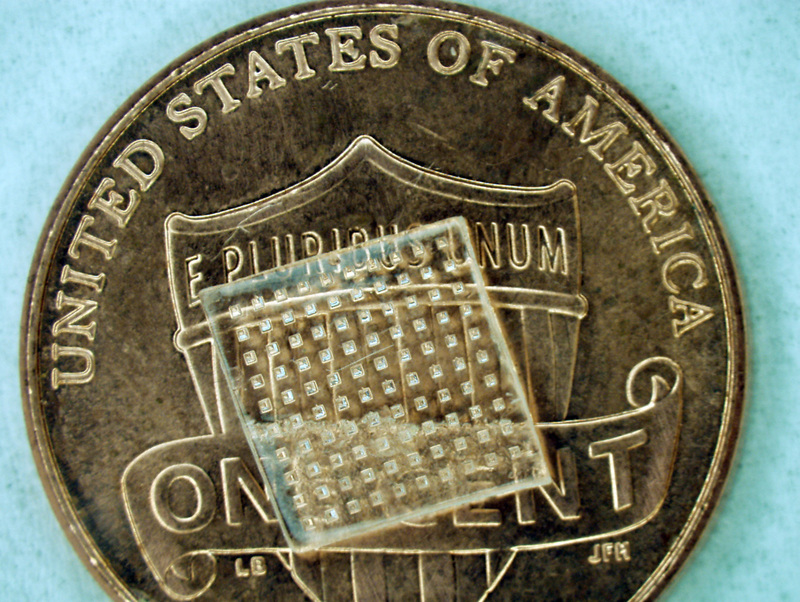 The patches used in that study contained needles just 650 microns long, assembled into arrays of 100 needles. Pressed into the skin, the needles quickly dissolved into bodily fluids thanks to their hydrophilic polymer material, carrying the vaccine with them and leaving only a water-soluble backing. In contrast, use of hypodermic needles leaves the problem of “sharps” disposal. 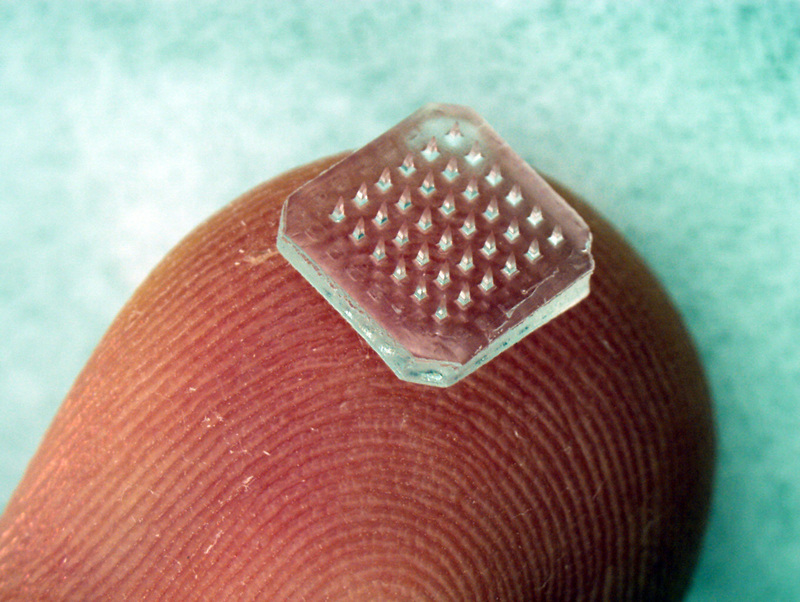 Prausnitz hopes that the $10 million in NIH funding will help accelerate development of the microneedle patches to make them available for general use within five to ten years. News: "Disappearing Needles: Vaccine-Delivery Patch with Dissolving Microneedles Eliminates "Sharps" Waste and Improves Protection"
News: "Flu Vaccine Given in Microneedle Skin Patches Proves Effective in Mice"